All hand forming revolves around the processes of stretching and shrinking metal. Stretching means to lengthen or increase a particular area of metal while shrinking means to reduce an area. Several methods of stretching and shrinking may be used, depending on the size, shape, and contour of the part being formed. For example, if a formed or extruded angle is to be curved, either stretch one leg or shrink the other, whichever makes the part fit. In bumping, the material is stretched in the bulge to make it balloon, and in joggling, the material is stretched between the joggles. Material in the edge of lightening holes is often stretched to form a beveled reinforcing ridge around them. The following paragraphs discuss some of these techniques. 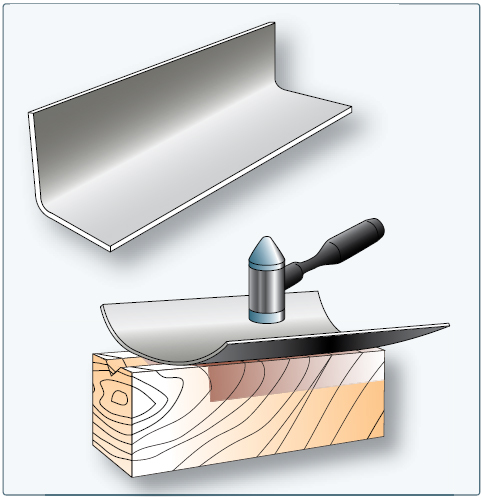 The cornice brake and bar folder are ordinarily used to make straight bends. Whenever such machines are not available, comparatively short sections can be bent by hand with the aid of wooden or metal bending blocks. 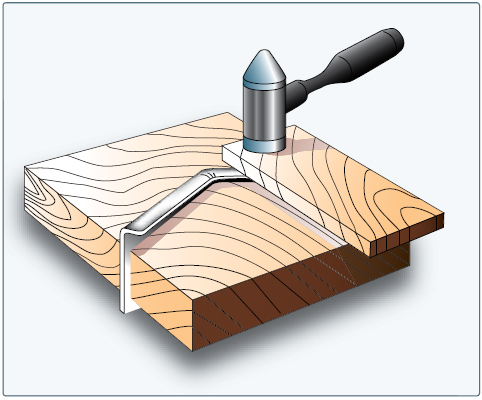 After a blank has been laid out and cut to size, clamp it along the bend line between two wooden forming blocks held in a vise. The wooden forming blocks should have one edge rounded as needed for the desired radius of bend. It should also be curved slightly beyond 90° to allow for spring-back. Bend the metal that protrudes beyond the bending block to the desired angle by tapping lightly with a rubber, plastic, or rawhide mallet. Start tapping at one end and work back and forth along the edge to make a gradual and even bend. Continue this process until the protruding metal is bent to the desired angle against the forming block. Allow for springback by driving the material slightly farther than the actual bend. If a large amount of metal extends beyond the forming blocks, maintain hand pressure against the protruding sheet to prevent it from bouncing. Remove any irregularities by holding a straight block of hardwood edgewise against the bend and striking it with heavy blows of a mallet or hammer. If the amount of metal protruding beyond the bending blocks is small, make the entire bend by using the hardwood block and hammer. Both formed and extruded types of angles can be curved (not bent sharply) by stretching or shrinking either of the flanges. Curving by stretching one flange is usually preferred since the process requires only a V-block and a mallet and is easily accomplished. In the stretching method, place the flange to be stretched in the groove of the V-block. [Figure 1] (If the flange is to be shrunk, place the flange across the V-block.) 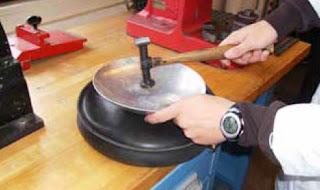 Using a round, soft-faced mallet, strike the flange directly over the V portion with light, even blows while gradually forcing it downward into the V.
Begin at one end of the flange and form the curve gradually and evenly by moving the strip slowly back and forth, distributing the hammer blows at equal spaces on the flange. Hold the strip firmly to keep it from bouncing when hammered. An overly heavy blow buckles the metal, so keep moving the flange across the V-block, but always lightly strike the spot directly above the V.
Lay out a full-sized, accurate pattern on a sheet of paper or plywood and periodically check the accuracy of the curve. Comparing the angle with the pattern determines exactly how the curve is progressing and just where it needs to be increased or decreased. It is better to get the curve to conform roughly to the desired shape before attempting to finish any one portion, because the finishing or smoothing of the angle may cause some other portion of the angle to change shape. If any part of the angle strip is curved too much, reduce the curve by reversing the angle strip on the V-block, placing the bottom flange up, and striking it with light blows of the mallet. Try to form the curve with a minimum amount of hammering, for excessive hammering work-hardens the metal. Workhardening can be recognized by a lack of bending response or by springiness in the metal. It can be recognized very readily by an experienced worker. In some cases, the part may have to be annealed during the curving operation. If so, be sure to heat treat the part again before installing it on the aircraft. Curving an extruded or formed angle strip by shrinking may be accomplished by either the previously discussed V-block method or the shrinking block method. While the V-block is more satisfactory because it is faster, easier, and affects the metal less, good results can be obtained by the shrinking block method. 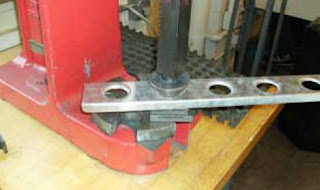 In the V-block method, place one flange of the angle strip flat on the V-block with the other flange extending upward. Using the process outlined in the stretching paragraphs, begin at one end of the angle strip and work back and forth making light blows. Strike the edge of the flange at a slight angle to keep the vertical flange from bending outward. Occasionally, check the curve for accuracy with the pattern. If a sharp curve is made, the angle (cross section of the formed angle) closes slightly. To avoid such closing of the angle, clamp the angle strip to a hardwood board with the hammered flange facing upward using small C-clamps. The jaws of the C-clamps should be covered with masking tape. If the angle has already closed, bring the flange back to the correct angle with a few blows of a mallet or with the aid of a small hardwood block. If any portion of the angle strip is curved too much, reduce it by reversing the angle on the V-block and hammering with a suitable mallet, as explained in the previous paragraph on stretching. After obtaining the proper curve, smooth the entire angle by planishing with a soft-faced mallet. If the curve in a formed angle is to be quite sharp or if the flanges of the angle are rather broad, the shrinking block method is generally used. In this process, crimp the flange that is to form the inside of the curve. When making a crimp, hold the crimping pliers so that the jaws are about 1⁄8-inch apart. By rotating the wrist back and forth, bring the upper jaw of the pliers into contact with the flange, first on one side and then on the other side of the lower jaw. Complete the crimp by working a raised portion into the flange, gradually increasing the twisting motion of the pliers. Do not make the crimp too large because it will be difficult to work out. The size of the crimp depends upon the thickness and softness of the material, but usually about 1⁄4-inch is sufficient. Place several crimps spaced evenly along the desired curve with enough space left between each crimp so that jaws of the shrinking block can easily be attached. After completing the crimping, place the crimped flange in the shrinking block so that one crimp at a time is located between the jaws. 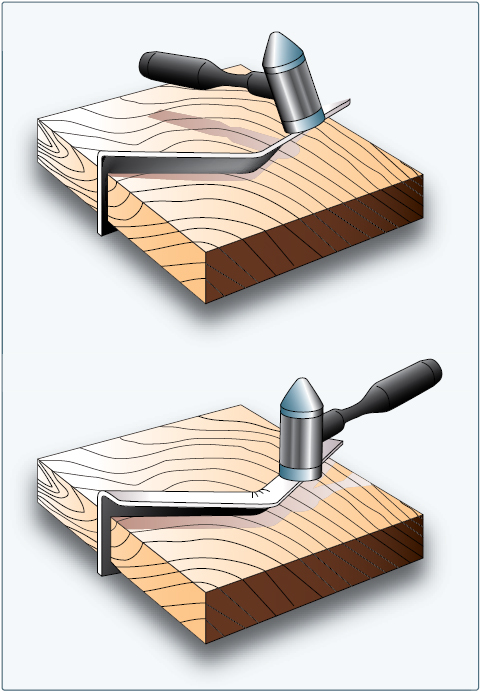 [Figure 2] Flatten each crimp with light blows of a soft-faced mallet, starting at the apex (the closed end) of the crimp and gradually working toward the edge of the flange. Check the curve of the angle with the pattern periodically during the forming process and again after all the crimps have been worked out. If it is necessary to increase the curve, add more crimps and repeat the process. Space the additional crimps between the original ones so that the metal does not become unduly work hardened at any one point. If the curve needs to be increased or decreased slightly at any point, use the V-block. 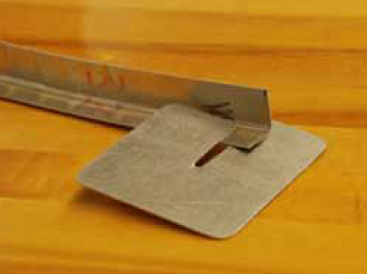 After obtaining the desired curve, planish the angle strip over a stake or a wooden form. The forming process for the following two flanged angles is slightly more complicated than the previously discussed angles because the bend is shorter (not gradually curved) and necessitates shrinking or stretching in a small or concentrated area. If the flange is to point toward the inside of the bend, the material must be shrunk. If it is to point toward the outside, it must be stretched. Cut the metal to size, allowing for trimming after forming. Determine the bend allowance for a 90° bend and round the edge of the forming block accordingly. Clamp the material in the form blocks, and bend the exposed flange against the block. After bending, tap the blocks slightly. This induces a setting process in the bend. Planish the flange after it is flattened against the form block and remove small irregularities. If the form blocks are made of hardwood, use a metal planishing hammer. If the forms are made of metal, use a softfaced mallet. Trim the excess material away and file and polish. Cut the material to size (allowing for trim), determine bend allowance for a 90° bend, and round off the edge of the block to conform to the desired radius of bend. Using a soft-faced stretching mallet, start hammering near the ends and work the flange down smoothly and gradually to prevent cracking and splitting. Planish the flange and angle as described in the previous procedure, and trim and smooth the edges, if necessary. Curved flanged parts are usually hand formed with a concave flange, the inside edge, and a convex flange, the outside edge. 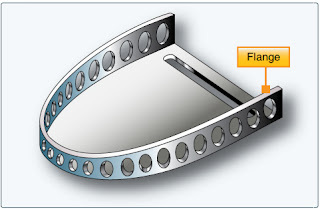 The concave flange is formed by stretching, while the convex flange is formed by shrinking. Such parts are shaped with the aid of hardwood or metal forming blocks. [Figure 6] These blocks are made in pairs and are designed specifically for the shape of the area being formed. These blocks are made in pairs similar to those used for straight angle bends and are identified in the same manner. They differ in that they are made specifically for the particular part to be formed, they fit each other exactly, and they conform to the actual dimensions and contour of the finished article. The forming blocks may be equipped with small aligning pins to help line up the blocks and to hold the metal in place or they may be held together by C-clamps or a vise. They also may be held together with bolts by drilling through form blocks and the metal, provided the holes do not affect the strength of the finished part. The edges of the forming block are rounded to give the correct radius of bend to the part, and are undercut approximately 5° to allow for spring-back of the metal. This undercut is especially important if the material is hard or if the bend must be accurate. 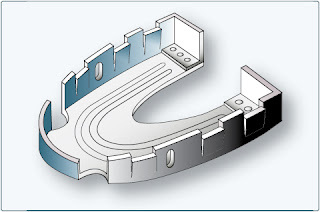 The nose rib offers a good example of forming a curved flange because it incorporates both stretching and shrinking (by crimping). They usually have a concave flange, the inside edge, and a convex flange, the outside edge. Note the various types of forming represented in the following figures. In the plain nose rib, only one large convex flange is used. [Figure 7] Because of the great distance around the part and the likelihood of buckles in forming, it is rather difficult to form. The flange and the beaded (raised ridge on sheet metal used to stiffen the piece) portion of this rib provide sufficient strength to make this a good type to use. In Figure 8, the concave flange is difficult to form, but the outside flange is broken up into smaller sections by relief holes. In Figure 9, note that crimps are placed at equally spaced intervals to absorb material and cause curving, while also giving strength to the part. Cut the material to size, allowing about 1⁄4-inch excess material for trim and drill holes for alignment pins. Remove all burrs (jagged edges). This reduces the possibility of the material cracking at the edges during the forming process. Locate and drill holes for alignment pins. 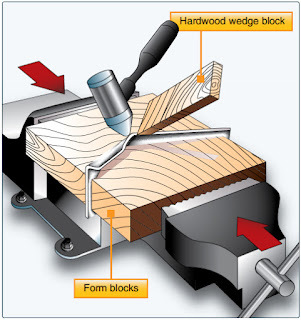 Place the material between the form blocks and clamp blocks tightly in a vise to prevent the material from moving or shifting. Clamp the work as closely as possible to the particular area being hammered to prevent strain on the form blocks and to keep the metal from slipping. Convex surfaces are formed by shrinking the material over a form block. 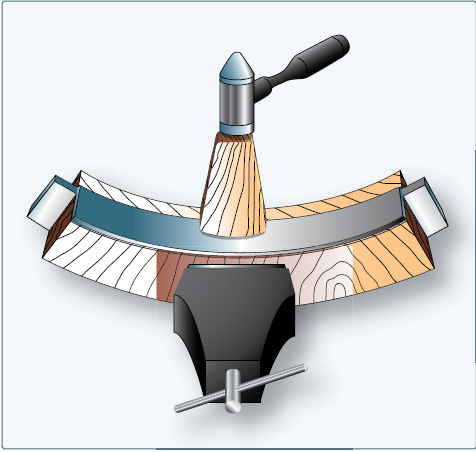 [Figure 12] Using a wooden or plastic shrinking mallet and a backup or wedge block, start at the center of the curve and work toward both ends. Hammer the flange down over the form, striking the metal with glancing blows at an angle of approximately 45° and with a motion that tends to pull the part away from the radius of the form block. Stretch the metal around the radius bend and remove the buckles gradually by hammering on a wedge block. Use the backup block to keep the edge of the flange as nearly perpendicular to the form block as possible. The backup block also lessens the possibility of buckles, splits, or cracks. Finally, trim the flanges of excess metal, planish, remove burrs, round the corners (if any), and check the part for accuracy. As discussed earlier, bumping involves stretching the sheet metal by bumping it into a form and making it balloon. [Figure 13] Bumping can be done on a form block or female die, or on a sandbag. Figure 13. Form block bumping. Either method requires only one form: a wooden block, a lead die, or a sandbag. The blister, or streamlined cover plate, is an example of a part made by the form block or die method of bumping. Wing fillets are an example of parts that are usually formed by bumping on a sandbag. 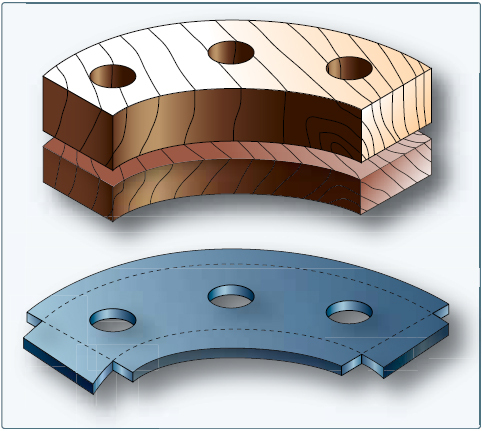 The wooden block or lead die designed for form block bumping must have the same dimensions and contour as the outside of the blister. To provide enough bucking weight and bearing surface for fastening the metal, the block or die should be at least one inch larger in all dimensions than the form requires. Hollow the block out with tools, such as saws, chisels, gouges, files, and rasps. Smooth and finish the block with sandpaper. The inside of the form must be as smooth as possible, because the slightest irregularity shows up on the finished part. Prepare several templates (patterns of the crosssection), as shown in Figure 13 so that the form can be checked for accuracy. Shape the contour of the form at points 1, 2, and 3. Shape the areas between the template checkpoints to conform the remaining contour to template 4. Shaping of the form block requires particular care because the more nearly accurate it is, the less time it takes to produce a smooth, finished part. Cut a metal blank to size allowing an extra 1⁄2 to 1-inch to permit drawing. Apply a thin coat of light oil to the block and the aluminum to prevent galling (scraping on rough spots). Clamp the material between the block and steel plate. Ensure it is firmly supported yet it can slip a little toward the inside of the form. Clamp the bumping block in a bench vise. Use a softfaced rubber mallet, or a hardwood drive block with a suitable mallet, to start the bumping near the edges of the form. Work the material down gradually from the edges with light blows of the mallet. Remember, the purpose of bumping is to work the material into shape by stretching rather than forcing it into the form with heavy blows. Always start bumping near the edge of the form. Never start near the center of the blister. Before removing the work from the form, smooth it as much as possible by rubbing it with the rounded end of either a maple block or a stretching mallet. Remove the blister from the bumping block and trim to size. Sandbag bumping is one of the most difficult methods of hand forming sheet metal because there is no exact forming block to guide the operation. [Figure 14] In this method, a depression is made into the sandbag to take the shape of the hammered portion of the metal. The depression or pit has a tendency to shift from the hammering, which necessitates periodic readjustment during the bumping process. The degree of shifting depends largely on the contour or shape of the piece being formed, and whether glancing blows must be struck to stretch, draw, or shrink the metal. When forming by this method, prepare a contour template or some sort of a pattern to serve as a working guide and to ensure accuracy of the finished part. Make the pattern from ordinary kraft or similar paper, folding it over the part to be duplicated. Cut the paper cover at the points where it would have to be stretched to fit, and attach additional pieces of paper with masking tape to cover the exposed portions. After completely covering the part, trim the pattern to exact size. Open the pattern and spread it out on the metal from which the part is to be formed. Although the pattern does not lie flat, it gives a fairly accurate idea of the approximate shape of the metal to be cut, and the pieced-in sections indicate where the metal is to be stretched. When the pattern has been placed on the material, outline the part and the portions to be stretched using a felt-tipped pen. Add at least 1-inch of excess metal when cutting the material to size. Trim off the excess metal after bumping the part into shape. If the part to be formed is radially symmetrical, it is fairly easy to shape since a simple contour template can be used as a working guide. The procedure for bumping sheet metal parts on a sandbag follows certain basic steps that can be applied to any part, regardless of its contour or shape. Determine the amount of metal needed, lay it out, and cut it to size, allowing at least 1⁄2-inch in excess. Place a sandbag on a solid foundation capable of supporting heavy blows and make a pit in the bag with a smooth-faced mallet. Analyze the part to determine the correct radius the pit should have for the forming operation. The pit changes shape with the hammering it receives and must be readjusted accordingly. Select a soft round-faced or bell-shaped mallet with a contour slightly smaller than the contour desired on the sheet metal part. Hold one edge of the metal in the left hand and place the portion to be bumped near the edge of the pit on the sandbag. Strike the metal with light glancing blows. Continue bumping toward the center, revolving the metal, and working gradually inward until the desired shape is obtained. Shape the entire part as a unit. Check the part often for accuracy of shape during the bumping process by applying the template. If wrinkles form, work them out before they become too large. Remove small dents and hammer marks with a suitable stake and planishing hammer or with a hand dolly and planishing hammer. Finally, after bumping is completed, use a pair of dividers to mark around the outside of the object. Trim the edge and file it smooth. Clean and polish the part. A joggle, often found at the intersection of stringers and formers, is the offset formed on a part to allow clearance for a sheet or another mating part. Use of the joggle maintains the smooth surface of a joint or splice. The amount of offset is usually small; therefore, the depth of the joggle is generally specified in thousandths of an inch. The thickness of the material to be cleared governs the depth of the joggle. In determining the necessary length of the joggle, allow an extra 1⁄16-inch to give enough added clearance to assure a fit between the joggled, overlapped part. The distance between the two bends of a joggle is called the allowance. This dimension is normally called out on the drawing. However, a general rule of thumb for figuring allowance is four times the thickness of the displacement of flat sheets. For 90° angles, it must be slightly more due to the stress built up at the radius while joggling. For extrusions, the allowance can be as much as 12 times the material thickness, so, it is important to follow the drawing. Lay out the boundary lines of the joggle where the bends are to occur on the sheet. Insert the sheet in the brake and bend the metal up approximately 20° to 30°. Release the brake and remove the part. Turn the part over and clamp it in the brake at the second bend line. Bend the part up until the correct height of the joggle is attained. Remove the part from the brake and check the joggle for correct dimensions and clearance. Since hardwood is easily worked, dies made of hardwood are satisfactory when the die is to be used only a few times. If a number of similar joggles are to be produced, use steel or aluminum alloy dies. Dies of aluminum alloy are preferred since they are easier to fabricate than those of steel and wear about as long. These dies are sufficiently soft and resilient to permit forming aluminum alloy parts on them without marring, and nicks and scratches are easily removed from their surfaces. Lightening holes are cut in rib sections, fuselage frames, and other structural parts to decrease weight. 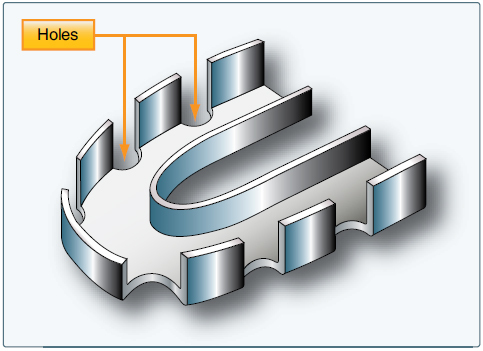 To avoid weakening the member by removal of the material, flanges are often pressed around the holes to strengthen the area from which the material was removed. Lightening holes should never be cut in any structural part unless authorized. The size of the lightening hole and the width of the flange formed around the hole are determined by design specifications. Margins of safety are considered in the specifications so that the weight of the part can be decreased and still retain the necessary strength. Lightening holes may be cut with a hole saw, a punch, or a fly cutter. The edges are filed smooth to prevent them from cracking or tearing. Form the flange by using a flanging die, or hardwood or metal form blocks. Flanging dies consist of two matching parts: a female and a male die. For flanging soft metal, dies can be of hardwood, such as maple. For hard metal or for more permanent use, they should be made of steel. The pilot guide should be the same size as the hole to be flanged, and the shoulder should be the same width and angle as the desired flange. 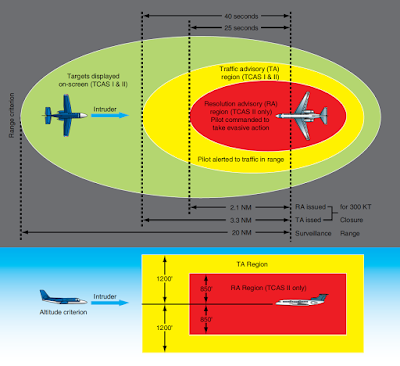 Figure 17. Lightening hole die set. Corrosion-resistant-steel (CRES) sheet is used on some parts of the aircraft when high strength is required. CRES causes magnesium, aluminum, or cadmium to corrode when it touches these metals. To isolate CRES from magnesium and aluminum, apply a finish that gives protection between their mating surfaces. It is important to use a bend radius that is larger than the recommended minimum bend radius to prevent cracking of the material in the bend area. When working with stainless steel, make sure that the metal does not become unduly scratched or marred. Also, take special precautions when shearing, punching, or drilling this metal. It takes about twice as much pressure to shear or punch stainless steel as it does mild steel. Keep the shear or punch and die adjusted very closely. Too much clearance permits the metal to be drawn over the edge of the die and causes it to become work hardened, resulting in excessive strain on the machine. When drilling stainless steel, use an HSS drill bit ground to an included angle of 135°. Keep the drill speed about one-half that required for drilling mild steel, but never exceed 750 rpm. Keep a uniform pressure on the drill so the feed is constant at all times. Drill the material on a backing plate, such as cast iron, which is hard enough to permit the drill bit to cut completely through the stock without pushing the metal away from the drill point. Spot the drill bit before turning on the power and also make sure that pressure is exerted when the power is turned on. Inconel® refers to a family of nickel-chromium-iron super alloys typically used in high-temperature applications. Corrosion resistance and the ability to stay strong in high temperatures led to the frequent use of these Inconel® alloys in aircraft powerplant structures. Inconel® alloys 625 and 718 can be cold formed by standard procedures used for steel and stainless steel. Normal drilling into Inconel® alloys can break drill bits sooner and cause damage to the edge of the hole when the drill bit goes through the metal. If a hand drill is used to drill Inconel® alloys 625 and 718, select a 135° cobalt drill bit. When hand drilling, push hard on the drill, but stay at a constant chip rate. For example, with a No. 30 hole, push the drill with approximately 50 pounds of force. Use the maximum drill rpm as illustrated in Figure 18. A cutting fluid is not necessary when hand drilling. Drill pilot holes in loose repair parts with power feed equipment before preassembling them. Preassemble the repair parts and drill the pilot holes in the mating structure. Enlarge the pilot holes to their completed hole dimension. When drilling Inconel®, autofeed-type drilling equipment is preferred. Warning: Keep magnesium particles away from sources of ignition. Small particles of magnesium burn very easily. In sufficient concentration, these small particles can cause an explosion. If water touches molten magnesium, a steam explosion could occur. Extinguish magnesium fires with dry talc, calcium carbonate, sand, or graphite. Apply the powder on the burning metal to a depth of 1⁄2-inch or more. Do not use foam, water, carbon tetrachloride, or carbon dioxide. Magnesium alloys must not touch methyl alcohol. Magnesium is the world’s lightest structural metal. Like many other metals, this silvery-white element is not used in its pure state for stressed application. Instead, magnesium is alloyed with certain other metals (aluminum, zinc, zirconium, manganese, thorium, and rare earth metals) to obtain the strong, lightweight alloys needed for structural uses. When alloyed with these other metals, magnesium, yields alloys with excellent properties and high strengthto-weight ratios. Proper combination of these alloying constituents provide alloys suitable for sand, permanent mold and die castings, forging, extrusions, rolled sheet, and plate with good properties at room temperature, as well as at elevated temperatures. Light weight is the best known characteristic of magnesium, an important factor in aircraft design. In comparison, aluminum weighs one and one half times more, iron and steel weigh four times more, and copper and nickel alloys weigh five times more. Magnesium alloys can be cut, drilled, and reamed with the same tools that are used on steel or brass, but the cutting edges of the tool must be sharp. Type B rivets (5056-F aluminum alloy) are used when riveting magnesium alloy parts. Magnesium parts are often repaired with clad 2024-T3 aluminum alloy. While magnesium alloys can usually be fabricated by methods similar to those used on other metals, remember that many of the details of shop practice cannot be applied. Magnesium alloys are difficult to fabricate at room temperature; therefore, most operations must be performed at high temperatures. This requires preheating of the metal or dies, or both. Magnesium alloy sheets may be cut by blade shears, blanking dies, routers, or saws. Hand or circular saws are usually used for cutting extrusions to length. Conventional shears and nibblers should never be used for cutting magnesium alloy sheet because they produce a rough, cracked edge. Shearing and blanking of magnesium alloys require close tool tolerances. A maximum clearance of 3 to 5 percent of the sheet thickness is recommended. 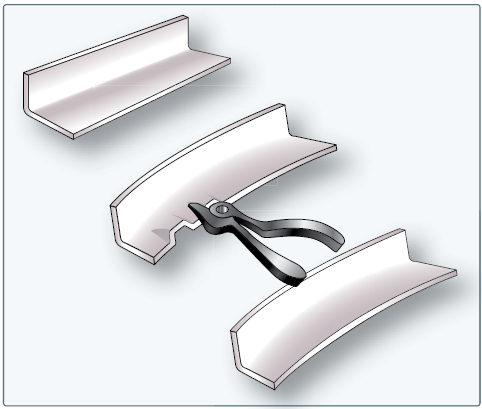 The top blade of the shears should be ground with an included angle of 45° to 60º. The shear angle on a punch should be from 2° to 3°, with a 1° clearance angle on the die. 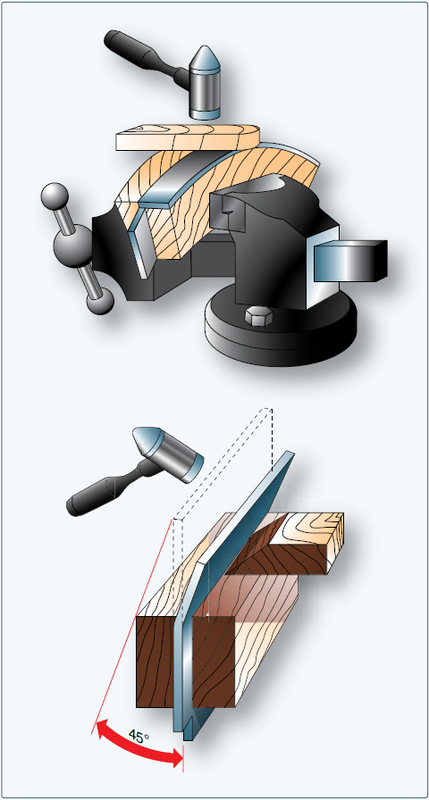 For blanking, the shear angle on the die should be from 2° to 3° with a 1° clearance angle on the punch. Hold-down pressures should be used when possible. Cold shearing should not be accomplished on a hard-rolled sheet thicker than 0.064-inch or annealed sheet thicker than 1⁄8-inch. Shaving is used to smooth the rough, flaky edges of a magnesium sheet that has been sheared. This operation consists of removing approximately 1⁄32-inch by a second shearing. Hot shearing is sometimes used to obtain an improved sheared edge. This is necessary for heavy sheet and plate stock. Annealed sheet may be heated to 600 °F, but hardrolled sheet must be held under 400 °F, depending on the alloy used. Thermal expansion makes it necessary to allow for shrinkage after cooling, which entails adding a small amount of material to the cold metal dimensions before fabrication. Sawing is the only method used in cutting plate stock more than 1⁄2-inch thick. Bandsaw raker-set blades of 4- to 6-tooth pitch are recommended for cutting plate stock or heavy extrusions. Small and medium extrusions are more easily cut on a circular cutoff saw having six teeth per inch. Sheet stock can be cut on handsaws having raker-set or straight-set teeth with an 8-tooth pitch. Bandsaws should be equipped with nonsparking blade guides to eliminate the danger of sparks igniting the magnesium alloy filings. Cold working most magnesium alloys at room temperature is very limited, because they work harden rapidly and do not lend themselves to any severe cold forming. Some simple bending operations may be performed on sheet material, but the radius of bend must be at least 7 times the thickness of the sheet for soft material and 12 times the thickness of the sheet for hard material. A radius of 2 or 3 times the thickness of the sheet can be used if the material is heated for the forming operation. Since wrought magnesium alloys tend to crack after they are cold-worked, the best results are obtained if the metal is heated to 450 °F before any forming operations are attempted. Parts formed at the lower temperature range are stronger because the higher temperature range has an annealing effect on the metal. Heating the dies and the material is expensive and troublesome. There are problems in lubricating and handling materials at these temperatures. It is more easily formed when hot than are other metals. Spring-back is reduced, resulting in greater dimensional accuracy. When heating magnesium and its alloys, watch the temperature carefully as the metal is easily burned. Overheating also causes small molten pools to form within the metal. In either case, the metal is ruined. To prevent burning, magnesium must be protected with a sulfur dioxide atmosphere while being heated. Proper bending around a short radius requires the removal of sharp corners and burrs near the bend line. Layouts should be made with a carpenter’s soft pencil because any marring of the surface may result in fatigue cracks. 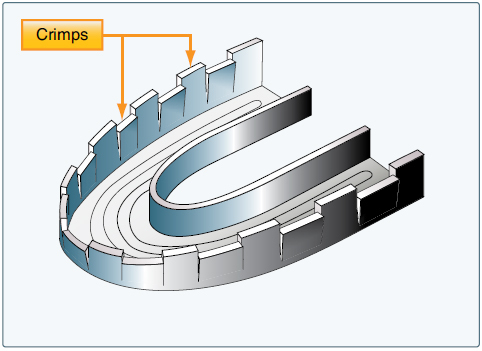 Press brakes can be used for making bends with short radii. Die and rubber methods should be used where bends are to be made at right angles, which complicate the use of a brake. Roll forming may be accomplished cold on equipment designed for forming aluminum. The most common method of forming and shallow drawing of magnesium is to use a rubber pad as the female die. This rubber pad is held in an inverted steel pan that is lowered by a hydraulic press ram. The press exerts pressure on the metal and bends it to the shape of the male die. The machining characteristics of magnesium alloys are excellent, making possible the use of maximum speeds of the machine tools with heavy cuts and high feed rates. Power requirements for machining magnesium alloys are about one-sixth of those for mild steel. Filings, shavings, and chips from machining operations should be kept in covered metal containers because of the danger of combustion. Do not use magnesium alloys in liquid deicing and water injection systems or in the integral fuel tank areas. Keep titanium particles away from sources of ignition. Small particles of titanium burn very easily. In sufficient concentration, these small particles can cause an explosion. If water touches molten titanium, a steam explosion could occur. Extinguish titanium fires with dry talc, calcium carbonate, sand, or graphite. Apply the powder on the burning metal to a depth of 1⁄2-inch or more. Do not use foam, water, carbon tetrachloride, or carbon dioxide. Titanium in its mineral state, is the fourth most abundant structural metal in the earth’s crust. It is light weight, nonmagnetic, strong, corrosion resistant, and ductile. Titanium lies between the aluminum alloys and stainless steel in modulus, density, and strength at intermediate temperatures. Titanium is 30 percent stronger than steel, but is nearly 50 percent lighter. It is 60 percent heavier than aluminum, but twice as strong. Titanium and its alloys are used chiefly for parts that require good corrosion resistance, moderate strength up to 600 °F (315 °C), and light weight. Commercially pure titanium sheet may be formed by hydropress, stretch press, brake roll forming, drop hammer, or other similar operations. It is more difficult to form than annealed stainless steel. Titanium can also be worked by grinding, drilling, sawing, and the types of working used on other metals. Titanium must be isolated from magnesium, aluminum, or alloy steel because galvanic corrosion or oxidation of the other metals occurs upon contact. Monel® rivets or standard close-tolerance steel fasteners should be used when installing titanium parts. The alloy sheet can be formed, to a limited extent, at room temperature. Over 5 percent of all titanium in the United States is produced in the form of the alloy Ti 6Al-4V, which is known as the workhorse of the titanium industry. Used in aircraft turbine engine components and aircraft structural components, Ti 6Al-4V is approximately 3 times stronger than pure titanium. The most widely used titanium alloy, it is hard to form. It is important to use a minimum radius chart when forming titanium because an excessively small radius introduces excess stress to the bend area. Stress relieves the part as follows: heat the part to a temperature above 1,250 °F (677 °C), but below 1,450 °F (788 °C). Keep the part at this temperature for more than 30 minutes but less than 10 hours. A powerful press brake is required to form titanium parts. Regular hand-operated box and pan brakes cannot form titanium sheet material. A power slip roller is often used if the repair patch needs to be curved to fit the contour of the aircraft. Titanium can be difficult to drill, but standard high-speed drill bits may be used if the bits are sharp, if sufficient force is applied, and if a low-speed drill motor is used. If the drill bit is dull, or if it is allowed to ride in a partially drilled hole, an overheated condition is created, making further drilling extremely difficult. Therefore, keep holes as shallow as possible; use short, sharp drill bits of approved design; and flood the area with large amounts of cutting fluid to facilitate drilling or reaming. When working titanium, it is recommended that you use carbide or 8 percent cobalt drill bits, reamers, and countersinks. Ensure the drill or reamer is rotating to prevent scoring the side of the hole when removing either of them from a hole. Use a hand drill only when positive-power-feed drills are not available. The largest diameter hole that can be drilled in a single step is 0.1563-inch because a large force is required. Larger diameter drill bits do not cut satisfactorily when much force is used. Drill bits that do not cut satisfactorily cause damage to the hole. - Increases the diameter of the hole in 0.0313-inch or 0.0625-inch increments. Cobalt vanadium drill bits last much longer than HSS bits. The recommended drill motor rpm settings for hand drilling titanium are listed in Figure 19. The life of a drill bit is shorter when drilling titanium than when drilling steel. Do not use a blunt drill bit or let a drill bit rub the surface of the metal and not cut it. If one of these conditions occurs, the titanium surface becomes work hardened, and it is very difficult to start the drill again. When hand drilling two or more titanium parts at the same time, clamp them together tightly. To clamp them together, use temporary bolts, Cleco clamps, or tooling clamps. Put the clamps around the area to drill and as near the area as possible. When hand drilling thin or flexible parts, put a support (such as a block of wood) behind the part. Titanium has a low thermal conductivity. When it becomes hot, other metals become easily attached to it. Particles of titanium often become welded to the sharp edges of the drill bit if the drill speed is too high. When drilling large plates or extrusions, use a water soluble coolant or sulphurized oil. NOTE: The intimate metal-to-metal contact in the metal working process creates heat and friction that must be reduced or the tools and the sheet metal used in the process are quickly damaged and/or destroyed. Coolants, also called cutting fluids, are used to reduce the friction at the interface of the tool and sheet metal by transferring heat away from the tool and sheet metal. Thus, the use of cutting fluids increases productivity, extends tool life, and results in a higher quality of workmanship.